い and え are usually shown on the second and fourth place of や-row. You already have learned them. Yōon is a combination of the consonant of i-column syllables (ki, shi, chi, ni, hi, mi, ri, gi, ji, bi and pi) and ya, yu or yo. Yōon is described by i-column letters (き, し, ち, に, ひ, み, り, ぎ, じ, ぢ, び, ぴ) plus ゃ, ゅ, ょ (small や ゆ よ). Pronunciation of じゃ, じゅ, じょ and ぢゃ, ぢゅ, ぢょ are the same. Read き [ki] and や [ya] separately. Read きや [kiya] with no gap in between. Then omit [i] after [k]. This is yōon [kya] (one syllable). Click "YouTube" button below to subscribe our official channel. You can get information on new uploads. Go to the Writing section. The modern Japanese toilet has advanced features such as warm-water spray cleansing, seat heating, deodorization and more. 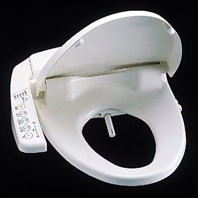 As of 2015, this type of toilet is installed in 77.5% of Japanese households. Once you are accustomed to this shower toilet, you never wish to go back to the conventional paper wipe. You can try out when you come to Japan at hotels, restaurants, department stores etc.